Memory, imaging and graphics solutions company PNY Technologies has added to its range of enterprise SSD drives with three new products designed for professional users. It is touting 'performance, price and endurance' in its new Prevail 5k SSD range, which uses eMLC NAND memory modules for high performance and is geared toward professional environments, such as CAD/CAM workstations, video editing, RAID server storage or cloud computing. Unsurprisingly, PNY claims its latest range of SSDs beats conventional HDDs for read/write speeds and provides reliability and performance when hosting complex applications. They take the baton from the company's previous line of Prevail Elite SSDs. 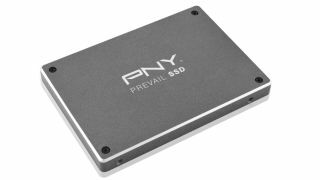 The PNY SSD Prevail 5k is available from the company's channel partners in 120GB, 240GB and 480GB versions. No word on UK pricing yet.